Very clean and comfortable. An excellent value. Front desk staff was very courteous and helpful. Would recommend it to anyone needing accommodations with shuttle service near the airport. We weren't in the hotel much since we were there for a concert. However, it was very nice and the girl at night gave us excellent directions to a restaurant just a few blocks away. 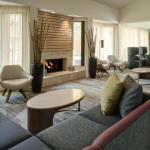 Consistent quality is why I like to stay at Courtyard by Mariott. Rooms were well kept and the staff was courteous and friendly. I didn't like that we had to pay extra if we wanted to get double beds instead of a king. This style hotel is what I feel most comfortable in. Not the Ritz, but not a no-tell motel either. Located 1 mile from the Indianapolis Airport and 9 miles from downtown Indianapolis, the Courtyard Indianapolis Airport is a newly renovated four-storey hotel. Modern design touches are illuminated with brighter task lighting, making the non-smoking property inviting. A buffet and hot breakfast is offered at The Courtyard Café, while a range of sandwiches, snacks and beverages are available at The Market, which opens 24-hours daily. Other dining outlets within walking distance of the hotel. Located 6 miles from the hotel is the Indiana State House, an 1888 Renaissance Revival restored building designed by Adolf Sherrer and Edwin May that features a rotunda with a stained-glass dome. All 141 rooms and 10 suites at Courtyard Indianapolis Airport have individually controlled air conditioning and climate control, satellite television with pay-per-view channels, two-line telephone with voice mail and toll-free local calls, electrical outlets at desk level, Internet access, iron & board, alarm clock, coffee/tea maker, daily newspaper, and daily housekeeping. The attached bathroom has hair dryer. Cribs are available on request. Business travelers can avail of copy, facsimile, post and overnight deliver/pickup services provided. Events for 35 (maximum) can be held in three meeting rooms equipped with audio visual aids and wireless Internet connectivity. Wireless Internet access is available in public areas of the hotel, enabling guests to plan days out or check emails. Catch up on the daily news in the lobby over complimentary coffee. Work out at the Fitness Center, take a swim at the indoor pool or lounge in the whirlpool. Other facilities available on-site include safe deposit boxes at the front desk, coin operated laundry, valet dry-cleaning, limousine service, vending machines and wheelchair rental. A range of face and body treatments are available at the Mystique Salon & Day Spa located 1 mile away. A foreign currency, beauty shop, bowling and miniature golf are located nearby. Rooms are spacious and clean with comfortable beds. The hotels staffs are welcoming and accommodating where possible. However, there is the odd feedback of occasional unconcerned service. This hotel is ideal for a short stopover between flights. There is a complimentary airport shuttle service offered by the hotel and should be requested when making reservations.